Max Weber is a magisterial figure in the social sciences. His fundamental contributions to the methodological and conceptual apparatus of sociology remain of continuing relevance to contemporary debates. 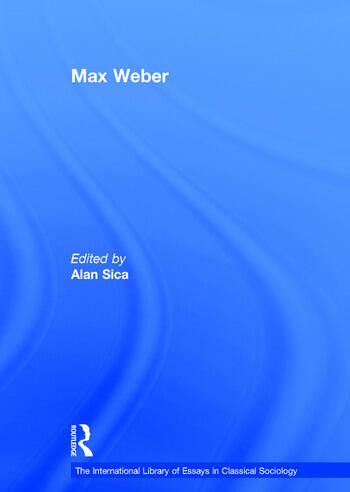 His astonishing range and quality of work on topics ranging from the comparative sociology of religion to political sociology, and the sociology of law to the sociology of music, have established Weber as a permanent point of reference for modern scholarship. Scholarly debates on the nature, significance and purpose of Weber's work demonstrate a significance for sociology's self-image that extends beyond their immediate interpretive importance. This volume, edited by one of the world's leading Weber scholars, offers an unparalleled selection of key Weber scholarship organized thematically and spanning the range of his sociological influence. Alan Sica is Professor of Sociology and Founding Director of the Social Thought Program at Pennsylvania State University. Amongst his many publications are 'Weber, Irrationality and Social Order' (California 1988); 'Max Weber and the New Century' (Transaction 2003) 'Max Weber: A Comprehensive Bibliography' (Transaction 2004); 'What is Social Theory? The Philosophical Debates (ed, Blackwell 1998); and 'Social Thought: From the Enlightenment to the Present' (ed, Allyn & Bacon 2004). He was Editor of the ASA journal, Sociological Theory journal from 1989 to 1994, and is currently Editor of Contemporary Sociology.